Brooklyn Park, MN- In much of Liberia’s troubled history of dictatorial and military rule, many people never got to know the pains relatives of students’ politicians went through whenever their loved ones were imprisoned by the government. But for the first time last Saturday, during a gathering of Liberian and American guests, a Liberian lady gave a touching testimony of the agony her family experienced before, or whenever their relative was placed behind the rusty gates of the Post stockade prison during the Doe’s military era. In an attempt to protect relatives and avoid possible reprisal against them by securities and soldiers of former military dictator Samuel Doe, Prof. Alaric Tokpa, then a student leader, is said to have warned his closed relatives to keep away by avoiding visitation whenever he was imprisoned by the “power that be” for his high-lined political activism during the 1980s, a period Liberia was ruled by military decrees. “Alaric Tokpa protected his family…he wanted us to stay away whenever he was put in jail,” said Marie Hayes, a cousin of Prof. Alaric Tokpa. Marie Hayes made this disclosure at a well-attended dinner tendered in honor of the professor by the “Friends of Alaric4Senate2014,” held March 22, at Brooklyn Park, Minnesota, USA. She said, the former student leader also advised them (relatives) to deny having any family tie to him (Tokpa) if ever they were to be questioned by people in the government. She said, that was his plea to them not that he didn’t want the family around him but it was a way to avoid his relatives being victimized by members of the military regime. During the period Liberia was ruled by military decrees, even the safety of the relatives and friends of those who were under detention as “political prisoners” were often in jeopardy. This period saw the frequent disappearances of family members of detained government opponents, including politicians. Aware of the dangers, political activist Tokpa may have considered his family’s security first while he braced for whatever consequences that could result from his students’ advocacy movement. Hayes lamented how difficult it was to cope with such situation but they (family members) had to do so because of his wish and beliefs, in order to remain safe. She said many people think “Alaric,” started his student movement in the 80s after he and some student activists were put into prison by the government and threatened with “firing squad.” But according to Hayes, the honoree actually started his student activism before the 80s. She recounted Alaric Tokpa’s political activities had come to the attention of former President William R. Tolbert who she said, questioned her about him one day while she was in the presence of the president as a student worker. Late President Tolbert, she said, had asked her out of curiosity; having apparently being told Hayes was a close relative of Tokpa. Not knowing the president’s intention toward “Alaric” and his student movement, Hayes said, she denied holding a close tie with the student political activist. “That man doesn’t come around me and I don’t see him either,” she told the president. For more than an hour before the honoree took the stage to speak, a long list of friends, admirers and former students taught by the professor at the University of Liberia, gave emotional testimonies one after the other, with all speaking to the political consistency, meekness, and the valor of one man that many in Liberia and beyond respect for his political beliefs. Among the speakers was Mr. Saylee Suworgo, now a campaigner for “Friends of Alaric4Senate2014.” He began by shouting their students’ movement battle cries “Zeequa,” as he walked to the podium with the crowd responding after him. It showed the popularity of the honoree and how he has been idolized by his supporters who went through the struggle with him during the heydays. Another speaker who also happened to be a former student of Prof. Tokpa, Mr. Kekula Foday, recalled how the honoree rescued him after he failed to pay his college tuition fees at the UL. He told guests that he was already missing classes due to his delinquency on the tuition payment and one day, to his surprise, an administrator informed that his fees were already paid and that he should return to class. He said, when he asked how, he was told Alaric Tokpa has paid the remainder of his tuition. The next speaker, a former student as well, spoke of Prof. Tokpa’s straightforwardness in dealing with his students. He explained, the professor would not do anything that will compromise his integrity as a professor. The honoree, he said, made him to re-do his “thesis” during his graduation year. He further maintained, that Prof. Tokpa’s action was done out of love to see him succeed in the future; benefits he said, he’s reaping today. Prof. Alaric Tokpa served as vice presidential candidate for Liberia’s geologist Cletus Wortorson’s Coalition of Political Parties during the country’s first post-war 1997 general presidential elections won by former dictator Charles M. Taylor. 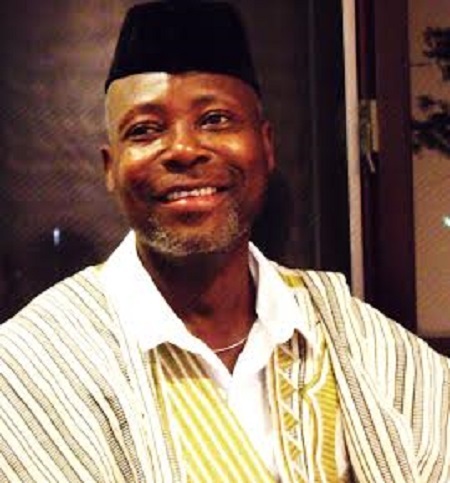 Prof. Tokpa is currently in the senatorial race for his home district of Gbarpolu, which until 1999 was part of Lofa County. The region is rich in timber and other mineral resources such as gold and diamonds and as a result, it became a contesting spot for rebel factions during the civil wars. In 1982, as a student leader for the Liberian National Student Union (LINSU), Alaric Tokpa along with another student political activist, Ezekiel Pajibo were sentenced to die through “firing squad” by the military regime of Samuel Doe for challenging a ban placed on students’ politics by the government. About three years later, Mr. Tokpa, together with five University of Liberia students’ activists which included a female, were declared “wanted dead or alive” on national TV and radio by the military government for their alleged involvement with the publication of the college’s underground leaflet known as REACT! The rest were: Mr. James Fromayan, Ezekiel Pajibo, Christian Herbert, Lucia Massalley and Dempster Yallah. The publication of the influential college pamphlet, REACT, was timely because, it helped filled the void created by the military’s crackdown on the independent press in the country. 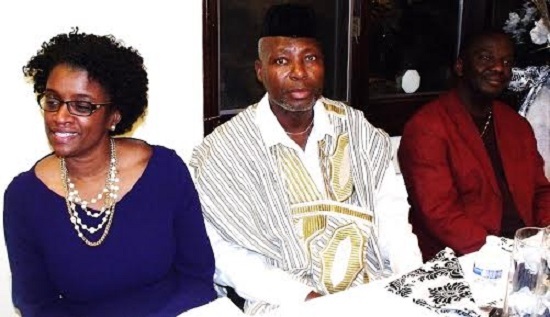 After the military regime place a “bounty” on their heads, Mr. Tokpa and his colleagues who had gone underground in the wake of the announcement, decided to turn themselves in to the Liberia Council of Churches. In a brief interview with this writer Tuesday, Prof. Tokpa indicated, the LCC in turn turned them over to the UL authorities which finally turned them over to the military regime. All six students’ leaders were tried by a military tribunal without the benefit of legal counsels before being whisked off to the country’s most notorious prison in Belle Yella where they were subjected to hard labor for about eight months before their release in September of 1985. In his speech of gratitude, Prof. Tokpa stressed the importance of the honor bestowed upon him and said, he would accept such recognition based on his conviction that he has for many years “remained consistent in [the] struggle [for freedom and justice] despite threats of death” against him. 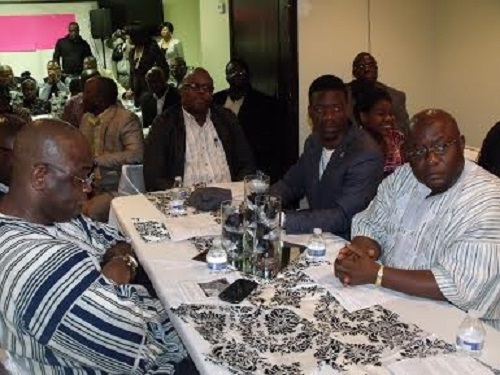 Prof. Tokpa, during his speech, maintained that “an honoring dinner program” wasn’t “a time for much talking.” However, he acknowledged this particular “recognition” imposed upon him an “obligation” for which reason he felt compellingly required to say something about” what he called, “the threat of breakdown” Liberia is presently faced with. “We have the power. Be not deceived. We have the power to change Liberia. We must know that we have that power. We must claim that power. We must utilize that power in a progressive democratic manner,” he declared. Earlier, Prof. Tokpa was introduced to the audience by his teenage daughter, Jangar Tokpa. Other personalities that graced the event included Joy Marsh-Stephens, a candidate for Brooklyn Park 2014 Mayoral Election, Mrs. Tarlor Quiwonkpa, a social activist, and Prof. Mahmood El-Kati, an elder and U.S. political historian on African American-African Affairs. The event organizers included Mr. James Quallah who served as Master of Ceremonies and Mr. Seyon Nyanwleh who gave a vote of thanks.